... Africa will not be a desert for infinity anymore! Well - here is kind of an application for the airline, of which I think it might be a valuable addition to an alliance. Valuable addition? Why should we need you? Several reasons: Africa on croydon is somewhat underdeveloped - if you take a close look at where African airlines are, you will eventually draw the conclusion most of these Airlines are clustered in South Africa, the Maghreb region and Kenya. Frankly: The tropics are deserted (notable exception: Kenya). What we are : A reliable carrier looking to change that! What we offer: Services to destinations you will never offer as your long-haul-routes. Please refer to the routemap I posted below! Several additional destinations have been projected, some also have been cancelled due to lack of demand. Africa is not an easy market, it's rather small, rather poor, plus rather immobile. One fact, that should appeal to you is the point Baobab Tanzanian is fairly "realistic", considering fleet structure and seating. We combine a rather high service standard, fair seats and reasonably low fares generating traffic flows that are not up for point-to-point travel. As a downside for some of you: Our fleet does contain some russian planes. The Yak-42D has proven to be a solid workhorse. Slightly smaller than most 737s, relatively cheap in operating costs, not too hampered by ORS penalties and with lots of power for shorter runways, it currently is one of our companies two legs. On top of that, it carries up to 11 boxes of cargo. As competition may arrive sooner or later, medium-term plans are still looking to phase it out in favor of 737NG planes. Our Saab 340B has just been sold to Oka Air Vostok. Fleet age averages 24 Years. With exception of the newly-leased Boeing 767, all these planes are company-owned, keeping fixed costs low. The Saab 340B, though highly profitable, has been phased out for maintenance and capacity reasons. No destinations were lost, a Yak42D has taken over the Saab's domestic schedule. And what do you need us for? We recently started long-haul operations from Dar-es-Salaam to Heathrow, daily, which turned out to be a big success. Low fares (510AS$ one way) flush lots of connecting flight passengers into the system, suddently routes which used to generate tiny profit margins are booked quite well. We'd like to further expand this - hand in hand with you. Several alliance hub are within perfect 767 range, using a stopover within Yammoussoukro-decision-terrain, America can be covered as well. Hubs in range: Oslo, Budapest, Lyon, Moscow, Bangkok, Jakarta, Medan, Bali, Shanghai, Beijing, Hongkong, Seoul. So - give me a boost, so I can return the favor! More international connections equal a higher demand for connecting flights within Africa, more destinations within Africa in turn equal a bigger pool of connecting passengers for your flights. We are looking forward to reopening our routes to Antanarivo and Harare! Strong alliance relationships ties could be further strengthened by taking BTA to the stock market, allowing fellow alliance members to get a return out of combined operations. BTA already is East-Africa's number one in passengers and cargo and bound to boldly underline this fact in red! Our goal: maintain and expand our strong market position, smart timetable and ultimately build a strong inter-African network. A West-African subsidiary might follow one day. Our fleet will be streamlined, 737s are going to be the backbone, 767 are of a reasonable size and economy for long-haul connections and a third maintenance category will follow some time. Whether smaller or larger than what we operate now will be determined later. That's the best part: Regarding interlining agreements, BTA is a blank sheet of paper! I always tend to hand-select my partners instead of accepting everybody. Right now, you are my first choice, which is why I am applying. On 2010/01/11, two interlining treaties with infinity members have been signed: Aero Oka Giraffe and Asian Wings are now part of the Trans-African network! And what will your CEO be able to contribute? Thanks for your message - I will gladly answer everything that might come up! By the way: To further introduce our flagship, here's a paint-scheme of 5H-AAO, "Prairie Lion", our 767-300ER! We'd also like to to inform you the routemap shown in post #1 is missing a destination currently served: Kinshasa (FIH) is served 7 times a week, using Boeing 737-200 Adv. equipment. Small update: We got a hand on two B73S today and sold our S340B to Aero Oka Vostok. 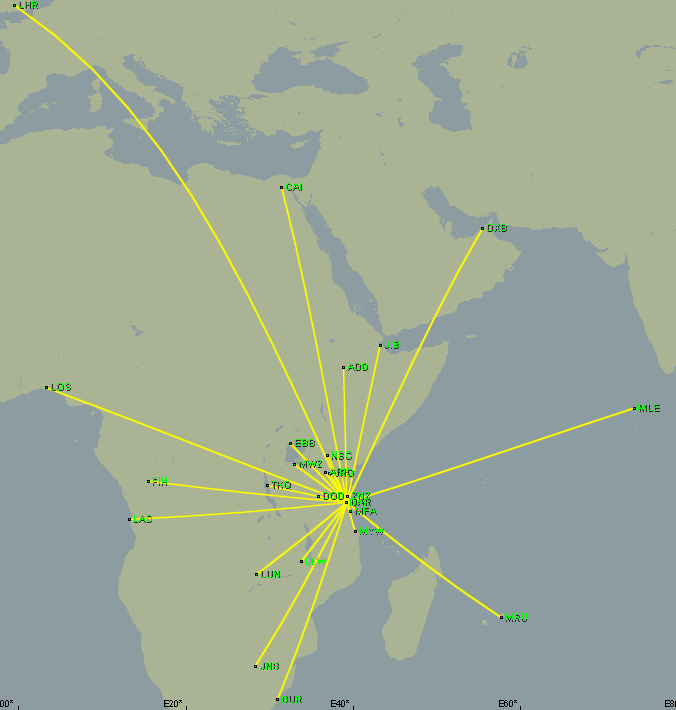 The routemap has been updated, new destinations include Luanda, Male, Mauritius and Durban. The new fleet composition can also be accessed in the starting post. We approved interlining applications by Aero Oka Giraffe and Asian Wings! This one will be in on trial-basis. What do we expect from Baobab to do about his fleet,as he's operating ancient planes? I certainly would like to propose that he'll buy/lease only newer (less than 23 years, average below 12) planes from now on for pax-flights. Well. Let's say, we give him 4 weeks on trial (due to the specific circumstances), and if during that time he's able to upgrade his fleet, then he's in as a full right member. Just a suggestion though. So, what do you think? Is 4 (or more, if necessary, but ideally 4) weeks a reasonable time for you to tackle that issue? I'm sure we could work out leases on some 737 Classics or MD-80s if you'd prefer to keep up appearances, heh. Generally: Yes - I cannot promise I will have phased out all of these 73S by then, but in case you do assist and help me to get some 735 (or, if everyone is interested, we could manage to do this via the stock-market - which could give me a big boost in modernizing the fleet), I think that's fairly possible. Will do my best! If i could get some connections from Europe, load factors will certainly rise quickly - which is also going to facilitate a modernization. In a nutshell: I'm in if you want me to be - trial is OK .